Across a variety of use cases -- online and offline, retail and remittance -- mobile is becoming the key channel for digital payments. However, as the market for mobile payments matured, it has become increasingly difficult for financial service providers across the value-chain to differentiate themselves. Activities which were once the domain of a few niche companies are becoming crowded, with both established payment industry leaders keen to expand their availability and an ever increasing number of pure-play digital operators. In each case, the players face distinct pain points -- but each new disruption can be either an opportunity or a challenge. 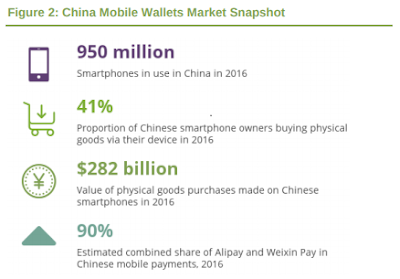 A recent market study by Juniper Research highlights the increasing dominance of Chinese companies in the evolving digital payments sector, with vendors such as Alibaba, Tencent and UnionPay seeking to increase their revenues via international expansion. According to their latest research, digital payment transaction values are expected to reach $5 trillion by 2021 -- that's up from $3.6 trillion this year, of which $3.4 trillion will likely originate from sales outside mainland China. The Juniper market study, which identified a series of key strategic approaches across the digital payments market, argues that both Alibaba and Tencent will capitalize on the growing spend by both Chinese tourists and immigrant workers, which is estimated to be worth over $200 billion per year. Potential game-changing actions include Alipay’s move to roll out in-store payments in Europe, and Tencent’s efforts to deploy its WeChat wallet, which processed more than $1.2 trillion in domestic payments in 2016, across international markets. Furthermore, UnionPay is seeking to position itself as an alternative to Visa and Mastercard in a number of emerging international markets, most notably within Russia. "UnionPay is struggling to gain domestic traction behind Alibaba’s Alipay, which is able to bypass UnionPay’s network when mobile payments are processed to offline merchants," said Dr Windsor Holden, head of forecasting & consultancy at Juniper Research. "Hence its focus is increasingly on building traffic from cross-border and international transactions." Meanwhile, this trend pinpoints the blockchain B2B solution developed by Chain and Visa as a digital transformation deployment for cross-border settlement in terms of transaction speed, transparency and accountability.